Storm Power's Ground Bar Kits enable multiple ground points to be connected quickly and easily. With 36 pre-drilled holes, this .25" x 4" x 24" Ground Bar meets or exceeds NEC grounding requirements. 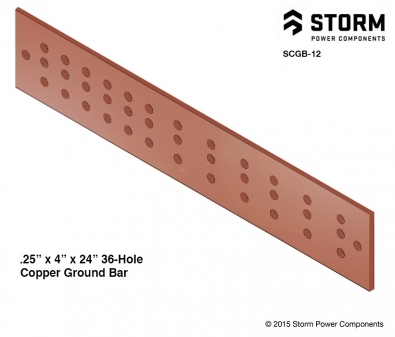 Designed and manufactured by Storm Power Components' Tennessee fabrication center, the solid copper ground (or bus bar) is the industry standard for equipment and tower grounding.